Our Hong Kong rooftop story started in one of the most exciting city districts, Caseuway Bay. We’ve headed there right after checking in to the hotel. In Hong Kong, getting to the roofs is quite easy. If it is a residential building, most likely, the roof is unlocked. Even more likely, that somebody already lives there. If it is a business-center, getting to the roof is a bit more complicated. Here the main quest is to get to the pompier ladder. And after you got there, you know what to do. Safety regulations are weird. All the exits are viewed with cameras; each door is equipped with an alarm (or even two), which notifies the police and building security in case of an alert. However, usually you don’t need any permission to get to the business center, and all the doors are open during working hours Monday to Friday, all the alarms are switched off. So, if you are interested in city views from the height without having any problems with the police, just buy a ticket to Hong Kong. Hong Kong is located on the islands, and without exaggeration, I can say that the city has very little space. Therefore, the buildings are high and located very densely. Hong Kong is a rooftoper’s paradise, all covered with skyscrapers. The area in Hong Kong is limited, so you can easily find a 40-stories skyscraper, which has only one or two apartments on each floor. The flat space sometimes is not more than eight square meters, where there are a corridor with a kitchenette, a bedroom and a WC with a shower. Due to the lack of the offers in the real estate market, Hong Kong housing is the most expensive in the world. It is 55% more expensive, than in London. Thereby, I’d like to tell you a story about the unique place named the Chungking Mansions. This rookery is located on the mainland (Kowloon). It is known for the cheapest flophouses in the city. In addition, it is a place where many immigrants (from India, Pakistan, Nepal, Bangladesh and so one) are hanging out. In the Chungking Mansions you can find everything: tiny guest houses with just a few rooms for rent, curry cafes, a market on the ground floor, a variety of shops, currency exchange offices, touristic offices, where you can get a Chinese visa. Next to the main entrance, you can always find the Indians and the Pakistanis, offering you to buy some hash, weed or even cocaine. During one of our trips, I decided to check what they will sell, to bate my curiosity. For 120 Hong Kong dollars, I got 3 grams of Kashmir hashish. I gave it to a European guy, living next door. No doubt, this building is a center of Hong Kong. People make jokes about it, that if a cop needs to arrest someone, he goes to the Chunking Mansions. Vadim on the Chunking Mansions roof. Before we had climbed the Shanghai Tower and posted pictures from Hong Kong to Facebook, the Urban Exploration was not that popular there. Maybe, there wasn’t any other active roofers except us. Now there are much more of them in the city, and we found that people started locking the entrances to the roofs. Istagram is full of pictures from the roofs of Hong Kong, and the security pay more attention to the cameras. Well, actually it is not true that there was no other roofers. Once we’ve met the Canadian rooftoper Tom Ryaboi. We have climbed to several roofs together. You can find me on this photograph, made by Tom. Hong Kong is full of interesting places. A lot of them are mentioned in the guidebooks, but some of them you can find only accidentally. It could be a street, stuffed with bars or shopping arcades, covering several districts, where you can buy different made-in-China things or Slumdog-type-cafes, where no one understands English and you can communicate only by gestures. A homeless woman we saw in one of the main streets. It’s worth mentioning that there are almost no homeless people in Hong Kong. Actually, it was the only time I saw one. The transportation and the distribution of the people flow in Hong Kong is great. You can easily get lost in a new city, but in Hong Kong, you can take your bearings by the evening of the first day you are there. Also, there are ships that run in between the Islands. We have tried to get the most of Hong Kong, in terms of roofing. The only places we have missed are “the new territories” – the sleeping areas of the city. Nevertheless, it is not as interesting, as the central part. Below you can see the most interesting photos from our trips to Hong Kong. 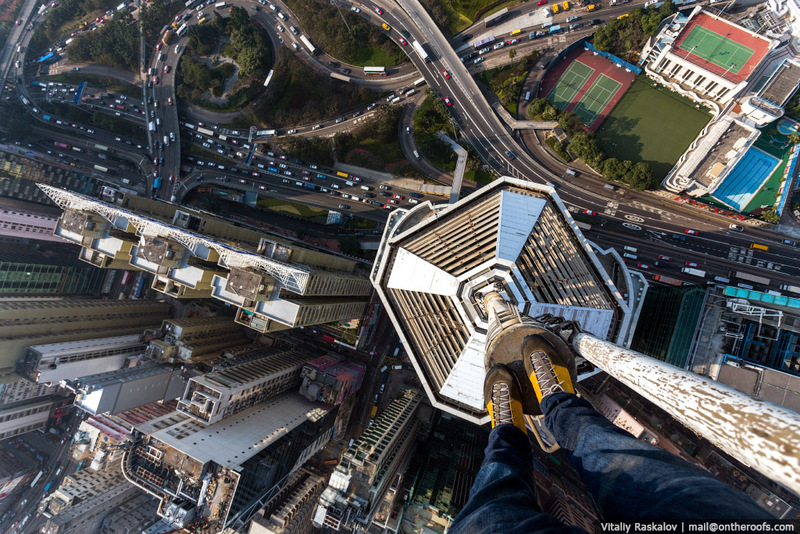 Vadim Makhorov is standing on the roof of one of the skyscrapers next to the famous Victoria Peak. Perhaps, this is the point with the best city view. It is much better, than the view from the Victoria Peak itself. The roof of the K11 building. The height is almost 300 meters. It is the second highest building on the mainland. The night view from there. Central Plaza is known for the highest church in the world, which is located there. The view from the Central Plaza. In Hong Kong, there is always some smog, it doesn’t matter, what the weather is. It is because of the factories, located nearby, in China. Only during the weekends and National holidays, there is a good visibility. Vadim Makhorov is making a shot with his feet on it. Not long ago we have produced a limited series of sweatshirts together with Codered. The sweatshirts were sold out fast, so we plan to produce a bunch of other clothes. We will inform you on that later. On this shot, you can see two highest buildings of Hong Kong. The picture is made from the terrace of a restaurant. Steeple of the business center. We couldn’t ignore the Tsing Ma suspension bridge, which is the sixth longest one in the world. The bridge has two levels of traffic: automobile road and a railroad. The upper level is a six-lane highway, three lanes each direction. The lower level has two railways and a two-lane emergency road for official purposes and for the movement during strong winds (Hong Kong sometimes exposed typhoons). The main span of the bridge is 1377 meters long, which is longer than the famous Golden Gate in San Francisco. The height of the pylons is 206 meters. Sure enough, we had climbed on top of it. A downwards view from the pylon. We got there in the night and stayed up there until the sunrise to make our photos. Finally, I’d like to show you several large panoramas of Hong Kong. Any of them, as well as all the other photos, you can purchase and print out at home. That’s all so far! Thank you for your attention. Stay tuned.